TC1232 is a fully-integrated processor supervisor. It provides three important functions to safeguard processor sanity: precision power on/off reset control, watchdog timer and external reset override. On power-up, the TC1232 holds the processor in the reset state for a minimum of 250msec after VCC is within tolerance to ensure a stable system start-up. Microprocessor sanity is monitored by the on-board watchdog circuit. The microprocessor must provide a periodic low-going signal on the ST input. Should the processor fail to supply this signal within the selected time-out period (150msec, 600msec or 1200msec), an out-of-control processor is indicated and the TC1232 issues a processor reset as a result. 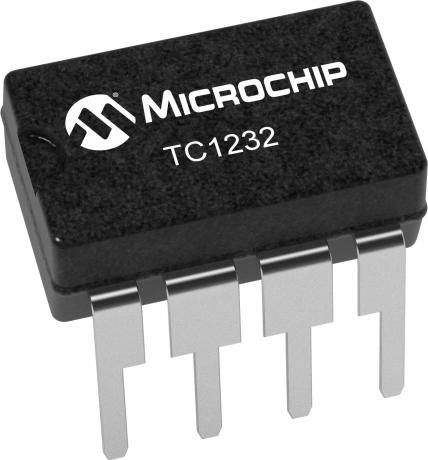 The outputs of the TC1232 are immediately driven active when the PB input is brought low by an external push-button switch or other electronic signal. When connected to a push-button switch, the TC1232 provides contact debounce. The TC1232 is packaged in a space-saving 8-pin plastic DIP or SOIC package and requires no external components.